Sometimes you will hear people talking about kombucha being great for “detoxing”, as if detoxing is some sort of mystical thing that helps achieve enlightenment. In fact, detoxing is one of the main functions of your liver and kidneys, and it turns out that a kombucha detox might not be such a silly idea after all! In this post I’m looking at a solid wee research paper that explores kombucha’s antioxidant effects. The research pretty clearly shows that when drinking kombucha, liver and kidney damage from industrial solvents is reduced. The research paper is similar to last week’s article about kombucha and diabetes, and indeed was referenced by last week’s authors as evidence that kombucha can counteract the effects of oxidative stress. This paper is not quite so complicated, though, as the researcher isn’t trying to draw a link to a human disease such as diabetes. He is merely attempting to see whether drinking kombucha protects against the damage done to the rats’ kidneys by an industrial solvent. On the other hand, of course, there are studies which show that in some people, having too much kombucha can cause liver damage. Moderation in all things, people. In 2009 O. Gharib published this research paper. drinking kombucha protected the rats’ livers from the industrial solvents carbon tetrachloride and trichloroethylene (TCE). Having established that kombucha could help prevent liver damage from TCE, this paper set out to look at whether it could prevent damage to the rats’ kidneys as well. When fed kombucha, kidney damage was reduced when the rats were exposed to TCE, an industrial solvent. TCE is an industrial solvent and degreaser with known health effects including liver damage, kidney damage, and neurological damage. When rats were fed kombucha, liver damage by TCE was reduced. He was investigating the antioxidant properties of Kombucha and the protective effects on the kidney of TCE-treated rats. Rats were killed, their kidneys removed and serum isolated. Results indicated that kombucha decreased the damage to the rats’ kidneys from TCE. He attributed this protective effect to acetic acid in the kombucha tea, which is able to bind to toxins, making them soluble and able to be passed out of the body. He also suggested that glucuronic acid in the kombucha might also be responsible for some of the detoxification that he detected. Glucuronic acid is produced in the livers of most mammals as part of the liver’s detox function. To me, this looks like a pretty solid wee study into the antioxidant effects of kombucha. The rats who had been drinking kombucha quite clearly survived the TCE much better than the rats who hadn’t. My one quibble with the study is that he over-reaches himself in his conclusion. He says that kombucha can help repair damage from substances such as TCE, when in fact his study cannot demonstrate that. 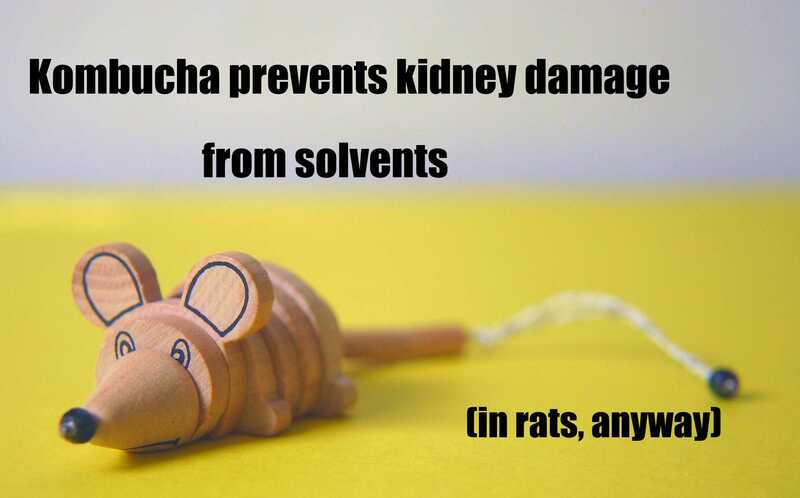 In order to show that kombucha can repair an already damaged kidney, the rats would need to be fed the TCE first. Then once their kidneys were already damaged, be fed kombucha to see if the kidneys got better. He didn’t do it that way around, and so we can’t tell if kombucha would have worked that way. All we can conclude is that 2 weeks of drinking daily kombucha at 1mL per kg protected the rats from later exposure to TCE. In short? Regular kombucha consumption certainly looks like it can help prevent damage from oxidative stress – in rats at least. Previous Previous post: Effect of kombucha on rats with drug-induced type 1 diabetes.